I am so happy to introduce my newest contributor to The Kim Six Fix. Pam is a fantastic fiber artist whose work I just love. It is an honor to have her sharing her tutorials with my readers and I know you will learn a ton. And make sure you are following her on Facebook, Instagram, Pinterest and of course on her blog. WELCOME PAM! Hi everyone! I'm Pam from Leaves & Stitches and I'm excited to be sharing my first tutorial with all of you. 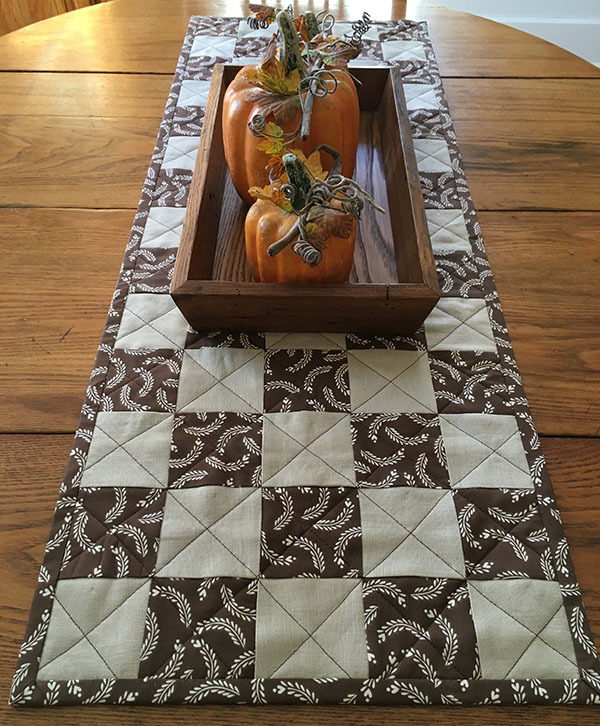 I'm going to show you how to make a simple quilted table runner. 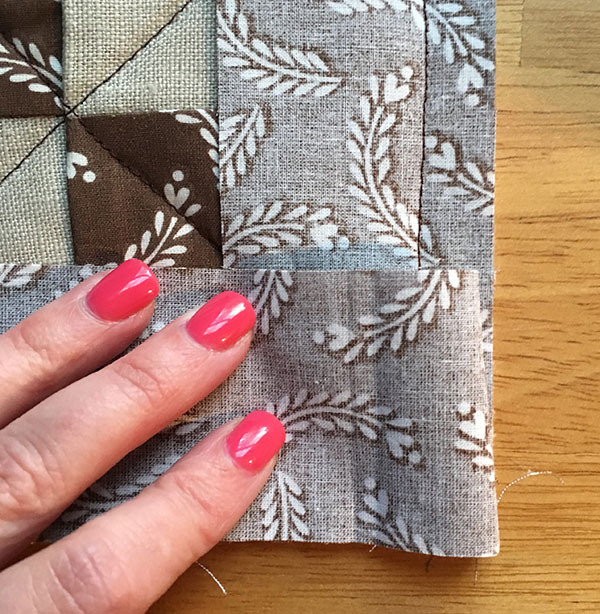 This is a great beginner quilt project - it's just basic patchwork and a straight binding, and I'll share a few of my favorite tricks as we go along. 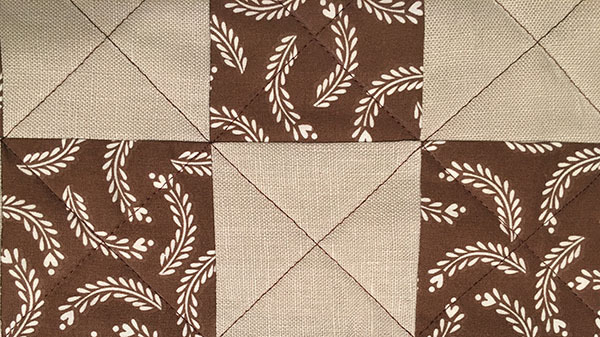 If you already have some experience quilting, you can easily finish this in an afternoon. Set the binding strips and backing panel aside for now. Cut the block strips into 3-1/2" squares. You'll need a total of 35 squares. 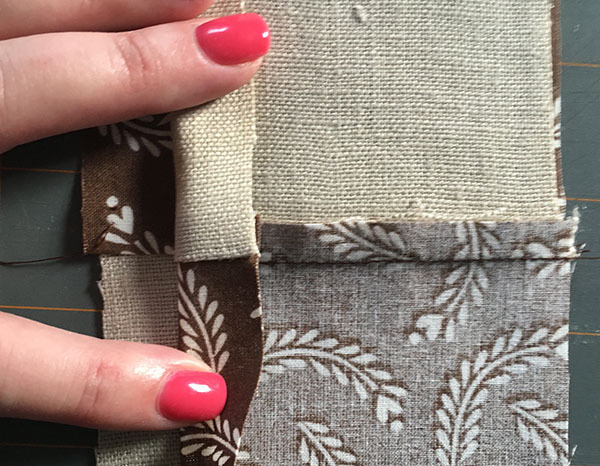 From your contrast fabric, cut three block strips, 3-1/2" x the width of the fabric. Cut the block strips into 3-1/2" squares. Again, you'll need 35 squares. Note: From this point forward, all seams are 1/4" unless otherwise noted. Set aside 7 main fabric squares and 7 contrasting fabric squares. 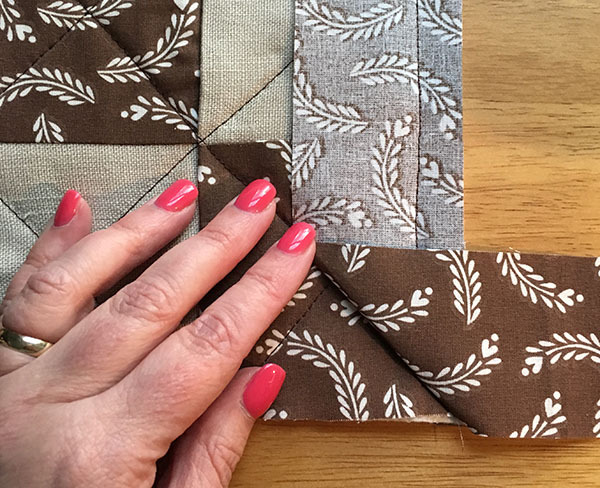 Pair up the rest of the squares, one main fabric square with each contrasting fabric square, right sides facing. Sew all the squares together along one side. It's much faster, and there are fewer stray threads to clean up when you're done! Snip the connecting threads and press the seams. You now have 28 pairs of squares. Match up two pairs, right sides facing, with the main fabric and contrasting fabrics alternating. Continue matching up the pairs and sew them together along one short edge. Press the seams. You now have 14 strips, each with 4 squares. Pin two strips together, alternating colors, right sides together, and match up the seams. 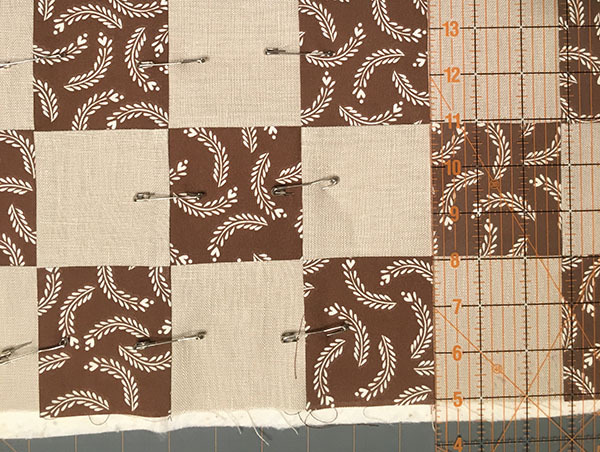 Continue pinning the rest of the strips in pairs, then sew them together. Press the seams. 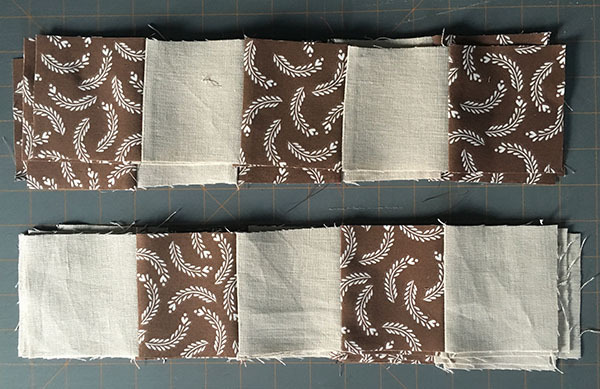 Repeat the process, pinning and sewing the two row segments, then again with the four row segments, and so on until all the strips are sewn together. Press all the seams on the front and back side of the piece. 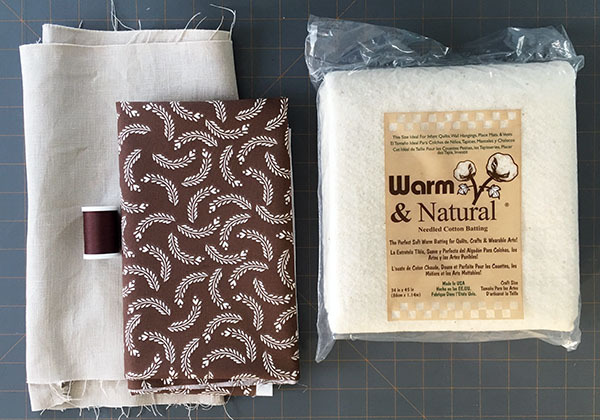 Lay your backing fabric on your work surface right side DOWN, and center the batting on top. Next, center the table runner top on the batting, right side UP. You should have a little extra batting and backing around each edge. 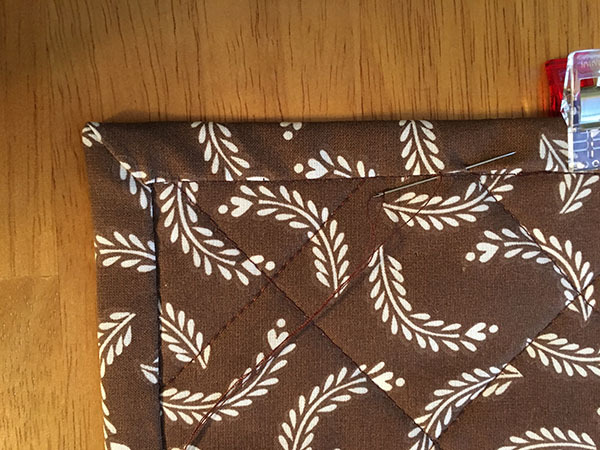 Pin through all the layers, placing the pins at the center of the seams joining the squares. 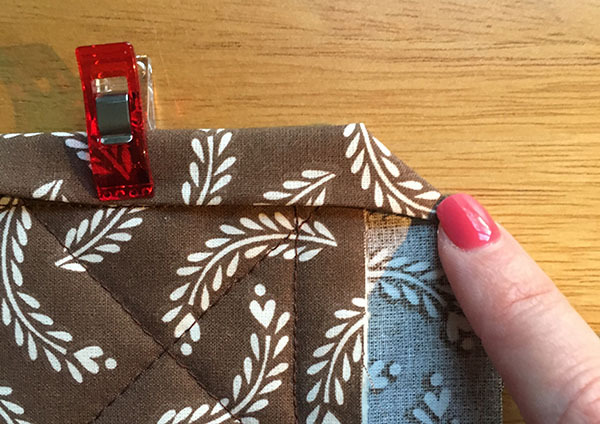 As you pin each row, use your quilting ruler to check that the seam lines are straight and the squares haven't stretched out of shape. 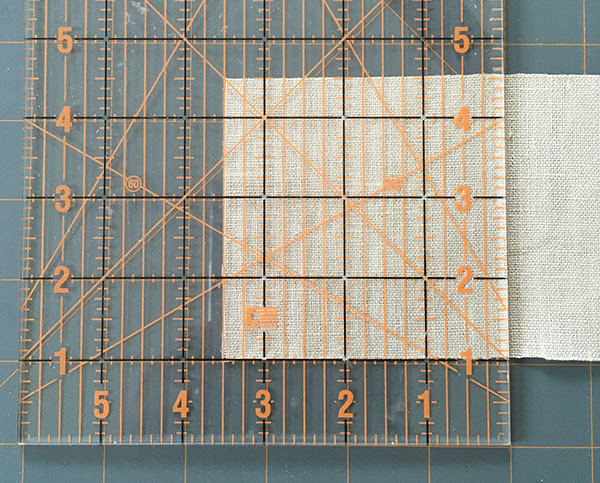 Once all the squares are pinned, begin at one corner and use the quilting ruler and marking pencil to mark a diagonal line through all the blocks. Starting at the center of the table runner and working your way out, quilt along the marked lines. 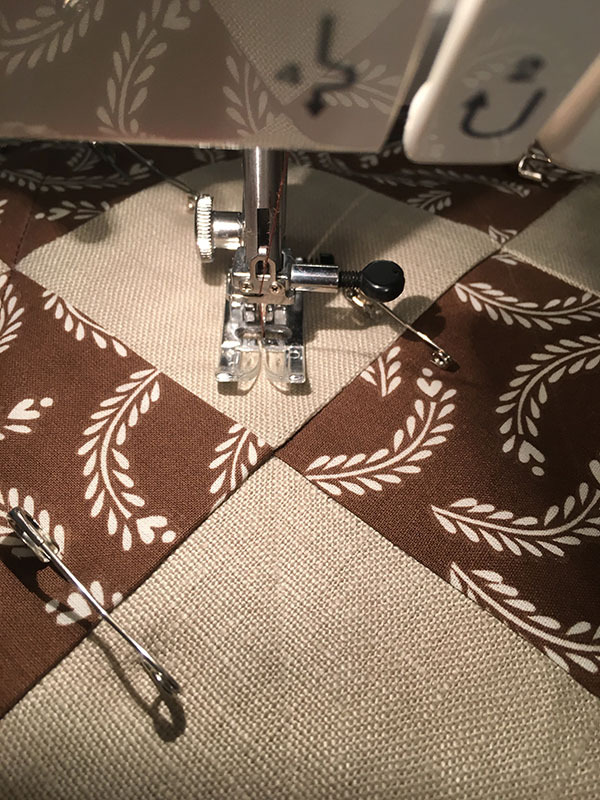 When you've finished quilting in one direction, lay the table runner on your work surface and mark a second set of diagonal lines, creating an "x" through each block. Beginning at the center of the runner and working your way out, quilt along the second set of lines. 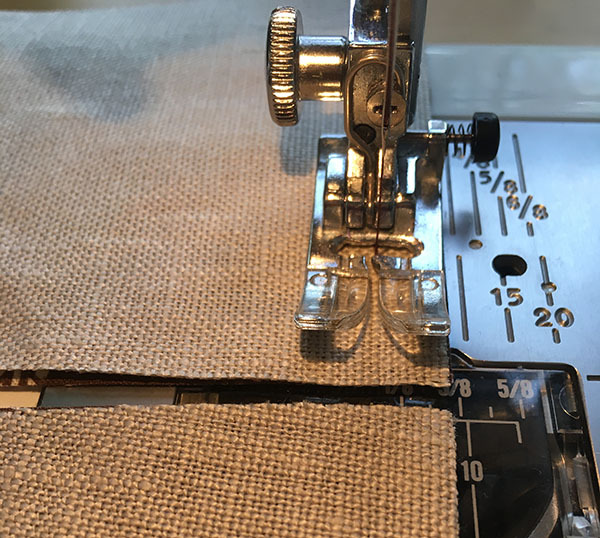 Lay the table runner out and use the quilting ruler and rotary cutter to trim away the excess batting and backing, squaring up all the edges as you go. 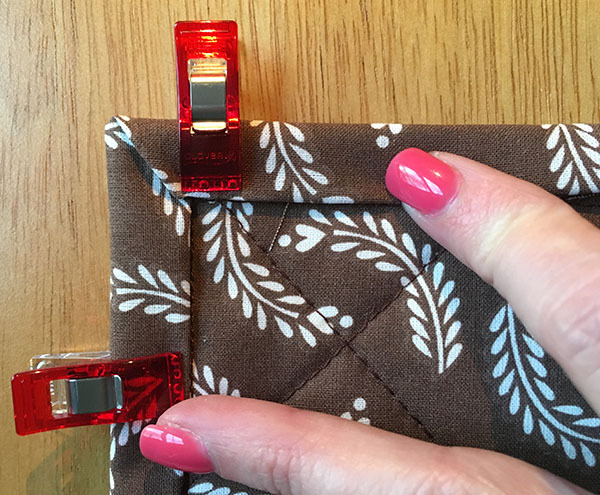 Join the three binding strips to create one long strip. Fold 1/2" of one raw end of the strip toward the wrong side and press. Beginning with the folded end of the binding, match up the edge of the binding with the edge of the runner top, right sides facing. Sew the binding to the using a 1/2" seam. 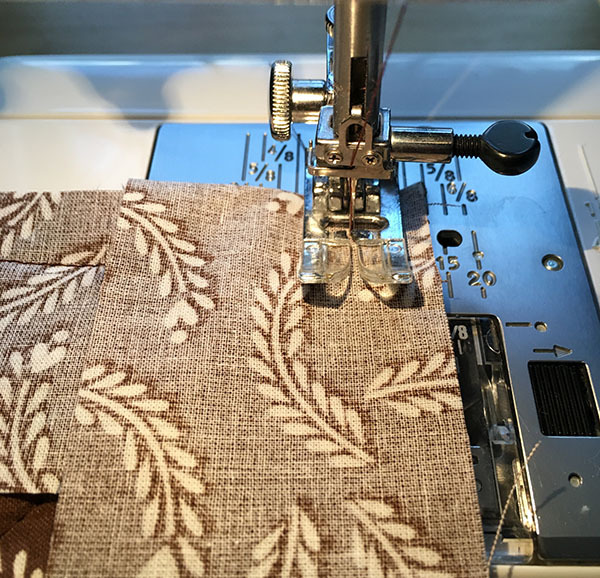 When you get to a corner, stop sewing 1/2" from the edge and remove the runner from the sewing machine. 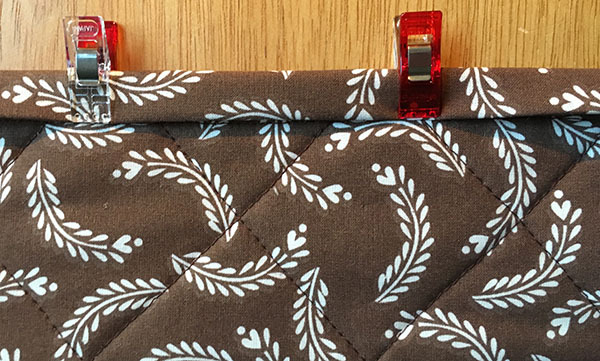 Fold the binding out from the runner at a 90-degree angle. Lightly press along the fold. Keeping that diagonal fold in place, carefully fold the binding back over to meet the top of the runner, right sides facing. The diagonal fold should now be sandwiched in between. Rotate the runner and continue sewing. Repeat the process for all four corners. When you've sewn all the way around to your starting point. Overlap the binding by 2"and trim away any excess. 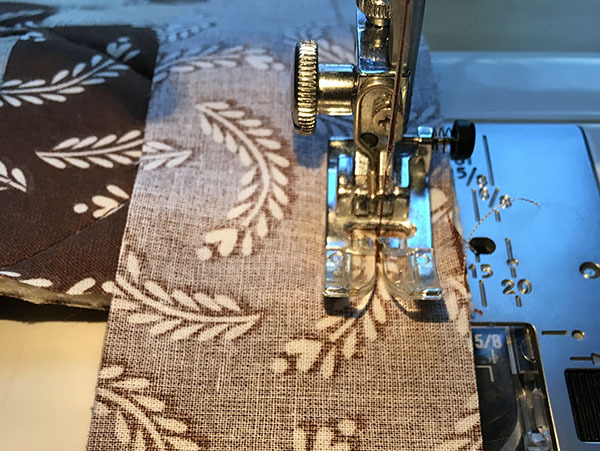 Open up the binding and press the seam, then fold the binding to the back of the table runner and turn under the raw edge, lining up the folded edge with the stitching line you just made when you attached the binding. Pin or clip the binding in place all the way around. To miter the corners, fold one side of the binding under and hold the other side out to create a diagonal fold out the outside edge. Now continue around the corner, folding under the raw edge of the binding. Hand stitch the binding in place on the back side. I love how this turned out and the colors are perfect for Thanksgiving! 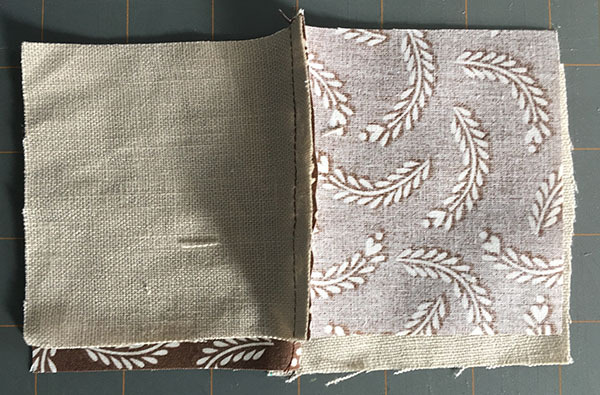 If you make your own table runner following this tutorial, please share a link in the comments. I love to see other people's finished projects!